Gastric cancer is the third most common cause of cancer-related death in the world,  and it remains difficult to cure in Western countries, primarily because most patients present with advanced disease. In the United States, stomach malignancy is currently the 15th most common cancer. The stomach begins at the gastroesophageal junction and ends at the duodenum. See the image below. The surgical approach in gastric cancer depends on the location, size, and locally invasive characteristics of the tumor. For patient education resources, see the Digestive Disorders Center as well as the patient education article Stomach Cancer. Management of stomach cancer requires a thorough understanding of gastric anatomy. An image depicting stomach anatomy can be seen below. The stomach begins at the gastroesophageal junction and ends at the duodenum. 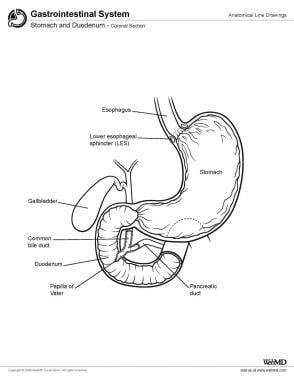 The stomach has three parts: the uppermost part is the cardia; the middle and largest part is the body, or fundus; and the distal portion, the pylorus, connects to the duodenum. These anatomic zones have distinct histologic features. The cardia contains predominantly mucin-secreting cells. The fundus contains mucoid cells, chief cells, and parietal cells. The pylorus is composed of mucus-producing cells and endocrine cells. Externally, the peritoneum of the greater sac covers the anterior surface of the stomach. A portion of the lesser sac drapes posteriorly over the stomach. The gastroesophageal junction has limited or no serosal covering. The right portion of the anterior gastric surface is adjacent to the left lobe of the liver and the anterior abdominal wall. The left portion of the stomach is adjacent to the spleen, the left adrenal gland, the superior portion of the left kidney, the ventral portion of the pancreas, and the transverse colon. The site of stomach cancer is classified on the basis of its relationship to the long axis of the stomach. Approximately 40% of cancers develop in the lower part, 40% in the middle part, and 15% in the upper part; 10% involve more than one part of the organ. Most of the decrease in gastric cancer incidence and mortality in the United States has involved cancer in the lower part of the stomach; the incidence of adenocarcinoma in the cardia has actually shown a gradual increase. Understanding the vascular supply of the stomach allows understanding of the routes of hematogenous spread. The vascular supply of the stomach is derived from the celiac artery. The left gastric artery, a branch of the celiac artery, supplies the upper right portion of the stomach. The common hepatic artery branches into the right gastric artery, which supplies the lower portion of the stomach, and the right gastroepiploic branch, which supplies the lower portion of the greater curvature. Understanding the lymphatic drainage can clarify the areas at risk for nodal involvement by cancer. The lymphatic drainage of the stomach is complex. Primary lymphatic drainage is along the celiac axis. Minor drainage occurs along the splenic hilum, suprapancreatic nodal groups, porta hepatis, and gastroduodenal areas. The rates of gastric cancer are higher in Asian and South American countries than in the United States; in Japan, for example, stomach cancer is the most common cancer site in males. Japan, Chile, and Venezuela have developed a very rigorous early screening program that detects patients with early-stage disease (ie, low tumor burden). These patients appear to do quite well. In fact, in many Asian studies, patients with resected stage II and III disease tend to have better outcomes than similarly staged patients treated in Western countries. Some researchers suggest that this reflects a fundamental biologic difference in the disease as it manifests in Western countries. The median age at gastric cancer diagnosis in the United States is 68 years; fewer than 2% of cases occur in persons younger than 35 years. The gastric cancers that occur in younger patients may represent a more aggressive variant or may suggest a genetic predisposition to development of the disease. Unfortunately, only a minority of patients with gastric cancer who undergo a surgical resection will be cured of their disease. Most patients have a recurrence. Several studies have investigated the patterns of failure after surgical resection alone. Studies that depend solely on the physical examination, laboratory studies, and imaging studies may overestimate the percentage of patients with distant failure and underestimate the incidence of local failure, which is more difficult to detect.